San Francisco 49ers new quarterback, Colt McCoy, shared his thoughts about Colin Kaepernick and what he thinks of the 49ers’ offensive strategy in a spontaneous question and answer session with interviewers. 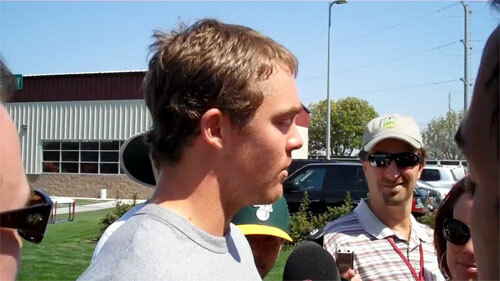 Photo shows new San Francisco QB, Colt McCoy, speaking about Colin Kaepernick & the 49ers. McCoy said that he would love to help Kaepernick any way he can. “We communicate out on the field, I ask questions, he’s smart in what we’re doing, he understands the system, the run game, the pass game, this is a game plan specific offense.” said McCoy. He went on to say that Kaepernick has been very helpful and that he is an amazing athlete … he’s fast and strong and doing a great job. Before joining the 49ers, McCoy played college football at the University of Texas in Austin. He was the starting quarterback for the Longhorns from 2006–2009 and won the 2008 Walter Camp Award and was the 2008 Heisman Trophy runner-up. McCoy is second to Boise’s State’s Kellen Moore in games won by a NCAA Division I quarterback. In his senior year, he won 13 of the top 15 major college player awards including quarterback of the year, offensive player of the year and outstanding football player of the year. He was drafted by the Cleveland Browns in the third round of the 2010 NFL Draft. McCoy is also a devout Christian and one of our more popular Christian speakers. If you would like to book football speakers, NFL stars or professional athletes like Colt McCoy for a speaking engagement, autograph signing, product endorsement, Super Bowl party, celebrity golf tournament, charity fundraiser or special event, you can request Colt McCoy agent and speaker fees at Sports Speakers 360. For booking agent and appearance fee information on how to hire San Francisco 49ers players for appearances, call 1.855.303.5450.